If you're curious about Rohmer, this well-researched guide provides thoughtful analysis of his work and themes. A collection of Rohmer's essays for Cahiers du Cinema, written between 1948 and 1977. Dealing with the fundamental and theoretical questions of filmmaking, it is a must read for all fans of the Nouvelle Vague. Crisp, dean of humanities at Australia's Griffth University, presents a succinct and perceptive study suitable for laymen and cineasts alike. 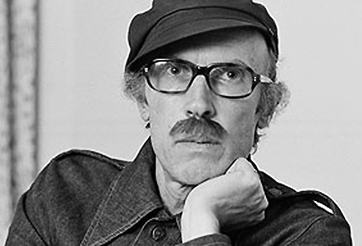 Eric Rohmer (born Jean-Marie Maurice Scherer, April 4, 1920 - January 11, 2010) was a screenwriter and director and a key figure in French New Wave cinema. He began writing film criticism in the late 1940’s and was, for some years, the editor of Cahiers du Cinema. He was the last of the major New Wave directors to become established, working at Cahiers du Cinema and in television, before achieving international success in the late 1960’s. Born Jean-Marie Maurice Scherer in 1920 in Nancy, a small town in Lorraine, Rohmer later moved to Paris, where he worked as a literature teacher and newspaper reporter. In 1946, under the pen name Gilbert Cordier, he published a novel titled, Elizabeth. Soon after, he began to focus on film criticism publishing two seminal articles in 1948: “Cinema, the Art of Space,” in Revue du Cinema, and “For a Talking Cinema,” in Les Temps Modernes. Both articles established the theoretical foundations that would guide his later criticism and film-making, as well as being highly influential on other directors of the New Wave. As a regular at the Cinematheque Francais he came into contact with Francois Truffaut, Jacques Rivette, Claude Chabrol, and Jean-Luc Godard. Around this time he adopted the pseudonym of Eric Rohmer, an amalgam of names of the director Erich Von Stroheim, and the author of the Fu Manchu stories, Sax Rohmer. Also in 1950, Rohmer made his first 16mm short film, Journal d’un Scelerat (A Villain’s Diary). Two years later, he began filming his debut feature film Les Petites Filles Modeles (Perfect Little Girls), but this was abandoned before it was completed. Rohmer continued making shorts through the 50’s in collaboration with friends such as Paul Gegauff, Jacques Rivette, editor Agnes Guillemot, and Jean-Luc Godard. He wrote the screenplay for Godard’s Tous les Garcons S’Appellent Patrick (All the Boys are Called Patrick, 1957). In 1956, Rohmer assumed editorial control of Cahiers du Cinema, a position he held for the next seven years. The following year, he co-wrote with Claude Chabrol, Hitchcock, the first serious appraisal of the director’s work. The book was a model of auteur criticism, combining detailed narrative analysis with great attention to technique. After directing one more short, Veronique et Son Cancre (Veronique and Her Dunce, 1958), Rohmer made his first feature, Le Sign du Lion (The Sign of Leo, 1959), through Claude Chabrol’s AJYM productions. Shot on location in and around Paris over seven weeks, the film tells the story of an impoverished musician who is forced to spend time living on the streets after failing to receive an expected inheritance. Low key and slow moving, the picture had disappointing screenings and wasn’t released commercially until 1962, when it failed to recoup any money. Meanwhile, Rohmer’s authority at Cahiers was beginning to deteriorate as Rivette, Doniol-Valcroze, and Truffaut began to pressure him to open up the critical range of the journal. Some of the recent New Wave films were being attacked by rival magazine Positif and other mainstream publications, and Truffaut, complained that Cahiers was too busy praising commercial American movies, when it should be defending challenging new French films. Doniol-Valcroze pressed for more political commentary in the magazine and an expanded range of films reviewed, including documentaries and Third World cinema. Rohmer, however, refused to revise his aesthetic criteria and was eventually ousted by Doniol-Valcroze, who controlled the money and rallied most of the staff behind him. Suddenly, he found himself without a job or career just as his former colleagues were finding international acclaim as directors. Through friends and admirers, he managed to get a job working for ORTF, the national radio and television unit, where he worked for some years directing over a dozen films including profiles of Lumiere and Dreyer for the Filmmakers of our Time series, as well as other documentaries on such diffuse subjects as the Parsifal legend, the Industrial Revolution, and the lives of Paris's female student population. In 1962, the year before he left Cahiers, Rohmer was approached by an enthusiastic young cinephile named Barbet Schroeder who had set up his own production company, Les Films du Losange, with money from his parents. Schroeder greatly admired Rohmer and offered to produce a short film, La Boulangere de Monceau (The Girl at the Monceau Bakery, 1963), through the company. This would become the first of the “Six Moral Tales”, which would become the focus of Rohmer’s output over the next ten years. Over the following years, Rohmer continued to collaborate with Shroeder, making a second short moral tale, La Carriere de Suzanne (Suzanne’s Career, 1963), and contributing an episode to the New Wave compilation Paris Vu Par (1964). Finally, in 1966, Rohmer completed La Collectioneuse (The Collector), the third of the Six Moral Tales and the first shot in colour. The film won the Silver Bear award at the Berlin Film Festival, helping to establish Rohmer’s international reputation, as well as the financial success of Les Films du Losange. Even greater success came with the next instalment of the Moral Tales, 1969’s Ma Nuit Chez Maud (My Night With Maud). Starring Jean-Louis Trintignant as a man who, on the eve of his marriage, is left alone with a beautiful divorcee and is forced to test his principles.It garnered Oscar nominations for Best Foreign Language Picture and Best Screenplay and become something of a hit in America. This was followed by the final parts in the series, Le Genou de Claire (Claire’s Knee, 1970), and Amour L’Apres-Midi (Love in the Afternoon, 1972). Both were about characters facing a mid-life crisis who are forced to make a moral decision, and both were critical successes across the world. Rohmer now had a small but loyal following. Following the Moral Tales, Rohmer made two period films: Die Marquis von O... (1976), from a novella by Heinrich von Kliest, and Percival Le Gallois (1978), based on a 12th century manuscript by Chretien de Troyes. Though now considered amongst his finest films, Percival, which featured actors speaking in verse, was his least typical work, and failed to find much success with audiences. the search for love. The most popular of these were the comedy Pauline a la Plage (1983) about the conflicting desires of various characters on a summer holiday, and the poetically wistful Le Rayon Vert (The Green Ray, 1986), which won the director the Golden Lion award at the Venice Film Festival in 1986. In the 1990’s Rohmer worked on a third series, the Tales of the Four Seasons, which included Conte de Printemps (1990), Conte d’Hiver (1992), Conte d’Ete (1996), and Conte d’Automne (1998). Each of these four films is set at a different time of the year corresponding with a different season. The central character in each film is coping with a recent emotional crisis and the films ends optimistically, looking forward to a more hopeful future. Rohmer’s next film, L’Anglaise et le Duc (The Lady and the Duke, 2001) was another surprising departure. This historical drama, set at the time of the French revolution, used cutting-edge digital technology, with actors embeded into painted backdrops. This was followed by Triple Agent (2005) set on the eve of the Second World War, and his final film, Les Amours d’Astree at de Celadon (2007), based on a 17th century work by Honore d’Urfe. In a career lasting over fifty years, Eric Rohmer remained remarkably faithful to the theoretical opinions he developed as a young critic, applying them consistently to all areas of his productions. He always relied strictly on an existing reality, avoiding close-ups, non-diegetic music, and any other cinematic devices he viewed as artificial. While some have criticised his films as being slow-moving and wordy, others have been enthralled by his subtle and absorbing character studies. Throughout his career, Rohmer proved that a director working on the margins of mainstream cinema could produce an important and highly personal body of work without giving into compromise. He died on January the 11th, 2010 at the age of 89. Need suggestions? See our list of the Top 10 Films of Francois Eric Rohmer. La Femme de l'aviateur The Aviator's Wife 1981 feature #1 Comédies et Proverbes (Comedies and Proverbs) – "It is impossible to think about nothing"
Le Beau mariage A Good Marriage 1982 feature #2 Comédies et Proverbes (Comedies and Proverbs) – "Can anyone refrain from building castles in Spain?" Pauline à la plage Pauline at the Beach 1983 feature #3 Comédies et Proverbes (Comedies and Proverbs) – "He who talks too much will hurt himself"
Les Nuits de la pleine lune Full Moon in Paris 1984 feature #4 Comédies et Proverbes (Comedies and Proverbs) – "He who has two women loses his soul, he who has two houses loses his mind"
Le Rayon vert The Green Ray/Summer 1986 feature #5 Comédies et Proverbes (Comedies and Proverbs) – "Ah, for the days/that set our hearts ablaze"
L'Ami de mon amie My Girlfriend's Boyfriend 1987 feature #6 Comédies et Proverbes (Comedies and Proverbs) – "My friends' friends are my friends"